The story of paper money goes back a long way. One could argue that its first emergence was even before 2500BC in Bablyon. 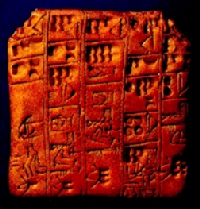 For the sake of convienence, banking transactions took place in the form of a clay tablet which served as a “letter or credit.” While such forms of money are known to have existed since the dawn of time, it is important to realize that such instruments were not of “official” issue on the part of government for the purpose of circulating units of money. The invention of banking actually preceded that of coinage. Banking originated in Ancient Mesopotamia where the royal palaces and temples provided secure places for the safe-keeping of grain and other commodities. Receipts came to be used for transfers not only to the original depositors but also to third parties. 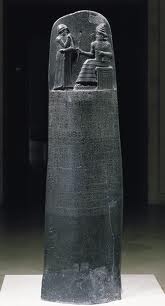 Eventually private houses in Mesopotamia also got involved in these banking operations and laws regulating them were included in the code of Hammurabi pictured here. In Egypt to the centralization of harvests in state warehouses also led to the development of a system of banking. 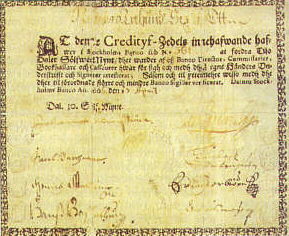 Written orders for the withdrawal of separate lots of grain by owners whose crops had been deposited there for safety and convenience, or which had been compulsorily deposited to the credit of the king, soon became used as a more general method of payment of debts to other persons including tax gatherers, priests and traders. Even after the introduction of coinage with the conquest of Alexander the Great in 334BC, these Egyptian grain banks served to reduce the need for precious metals which tended to be reserved for foreign purchases, particularly in connection with military activities. Therefore, this early form of paper money provided the domestic money supply, yet it was not an official issue of the government. Therefore, we do see metals in Egypt providing more of the international exchange. Before coins started to circulate in ancient Egypt after the conquest of Alexander the Great around 334BC who introduced coins, there was a system of values based on weights of gold, silver and copper at least for international trade. Metal measured in units of weight known as deben (around 90 g) could be used to settle bills and international trade. 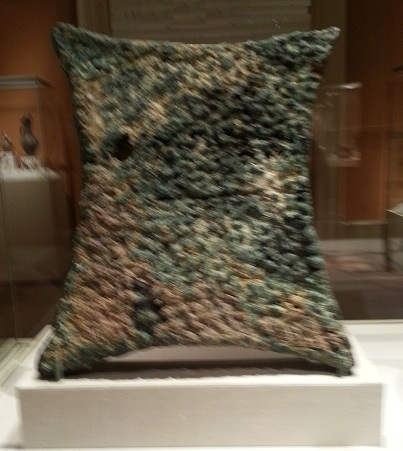 Records from the Eighteenth Dynasty (1550-1295 BC) show that often the actual metal did not change hands domestically and provided instead a unit of account by which two objects were measured. Egypt had no easily accessible source of silver, but the Egyptian word for silver, hedj, came to mean something close to ‘money’. 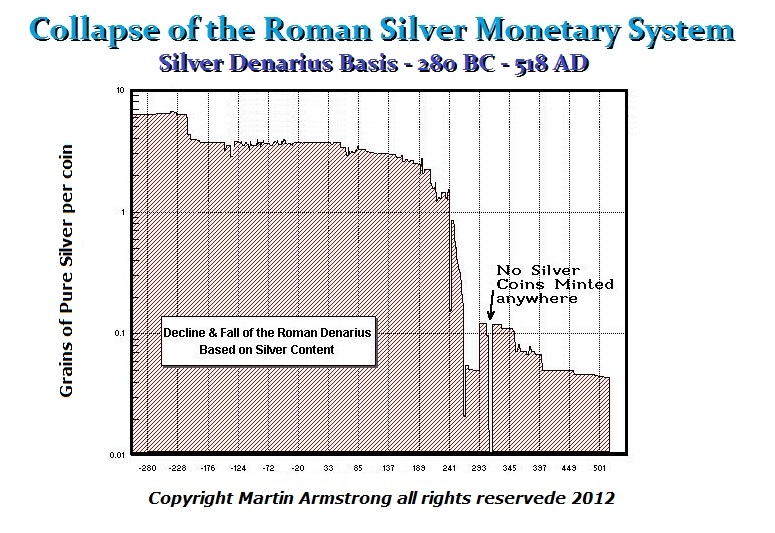 This tends to imply they traded with the Greeks whose monetary base was silver. These ingots and metal rings date from the fourteenth century BC and were found at el-Amarna. 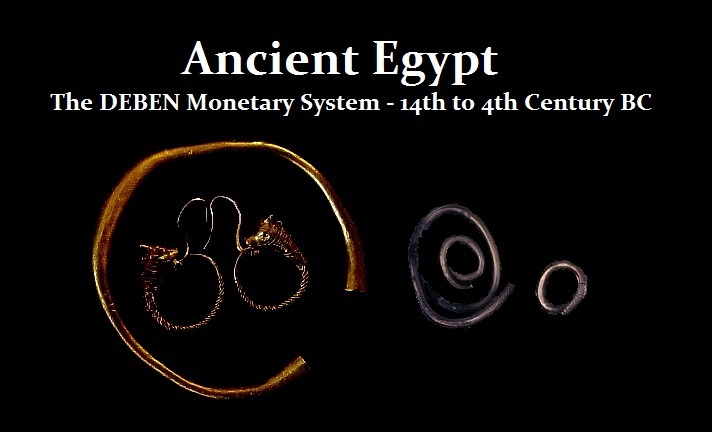 They give us rare archaeological evidence for Egypt’s earliest monetary system. The complete ingots weigh around 3 deben (265-286 g) and the rings seem to be fractions of the deben. Marco Polo, upon returning from his historical trip to China, told stories about how the people of China used paper as money. 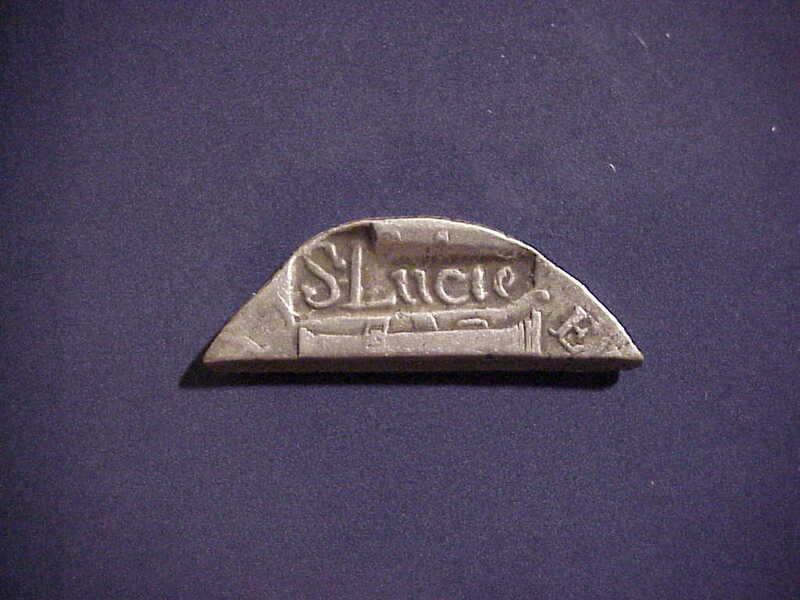 This was a form of money that was totally unheard-of in European Middle Ages. It is true, that letters of credit also emerged in China as early as 900 BC inscribed on paper rather than clay tablets. However, in the case of China, these letters of credit did evolve into an official form of paper money issued by the state. In both cases, the origin of paper money can be traced back to the practice of issuing a letter of credit. When Genghis Khan invaded China, which was using paper money, he too accepted it and did not devalue the paper money that was in circulation. He too accepted the paper money from the previous emperors. These stories of fiat are totally unsupported by history and rank up there with less credibility than even sea monsters. 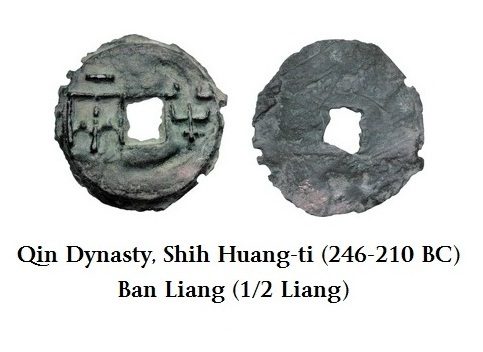 The earliest forms of money in the West appears to be cattle and then bronze. The use of money was linked to some utility value. Therefore, whatever served as money had to have a common practical value to both sides of a transaction. 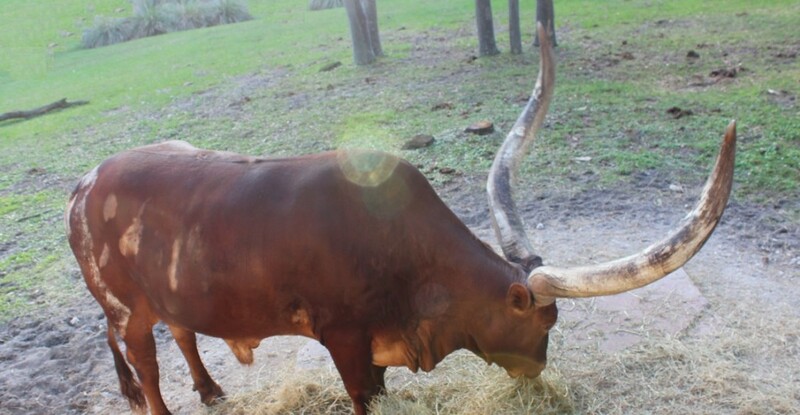 To this day in Africa, cattle remain as a medium of exchange. They tend to be prized and men will wear a string tied around their arm to display how many head of cattle they own to demonstrate their status and wealth. The Minoans seem to have used standardized units of bronze long before this appear in precious metals in the 7th century BC. The Romans used bronze but they were crude lumps that were by no means a standard weight system. It was not until the 3rd century BC that the Romans began to standardize their bronze into weights forming denominations. This standardization remains with us today and is the pound and ounce weights. In European culture, money itself emerged as an official unit of account certified by the state as to its weight and fineness around 600BC. Because of this origin, western culture still believes that money itself is worth something even though our paper currencies have evolved into merely circulating letters of credit backed by nothing more than the faith in the state. This is a strikingly different origin for money in the west as compared to eastern cultures. Before paper money was invented in the west, governments were unable to spend more than they had in their treasury. The kings and ministers who wanted to spend more than what they possessed normally resorted to raising taxes or they began to debase their coinage either by reducing its silver or gold content or by reducing the actual weight of the coinage. When the taxes became too overbearing, eventually revolution erupted among the people who then promptly overthrew the king and ministers, putting a swift end to deficit spending. This was one of the best methods to insure the normal checks and balances required to keep government spending in line. Government began getting involved with money first out of just standardizing the weight to facilitate trade as pictured above. That was the first step where the idea was metal did not require being weighed each and every time. The next step was make these standardized units of accounts official. Government then began to stamp the image or badge of the city to impress people that this was certified by the king. However, the first city to “coin” money was also the first to discover “fiat” meaning the value is simply dictated by government (which we do not have today because paper money floats without a fixed value). All money is fiat whenever government is involved if you define that terms properly as dictating its value rather than just meaning intangible money. 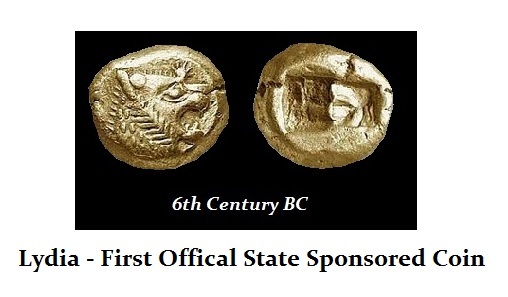 The stater was first issued from electrum with a weight of 14.2 grams, which was a natural alloy or gold and silver. Then King Croisos (KROISOS) separated the gold from the silver creating the first bimetallic monetary system and the gold stater now was standardized in weight at 10.9 grams. When war began with Persia, the weight was reduced to 8.71 grams and the value was raised. Government discovered the power of “fiat” arbitrarily establishing the value of money to make a profit regardless of its composition. When governments took the debasement route, inflation normally followed. This was a slower process but the end result was usually the same – one dead king. The process of fiscal mismanagement is interesting. The people tolerate economic abuse of government and this tends to instill a false sense of supreme power within our kings and ministers. The inflation that is created is typically slow and incremental at first. At some point this trend results in the gradual distrust of government and the steady decline in public confidence. At some point, government simply goes too far and confidence collapsed sharply in the shortest amount of time spreading like a disease within the community. This is what what see in Rome. As confidence declines and taxes rise, the producing people leave the cities and now even public safety declines. This typically produced higher crime and a decline in social values. The overriding factor to the entire game was always responsible government. Whatever monetary system was to be administered, it required integrity and responsibility or disaster would soon result. In many cases, when Kings or ministers became a little too deep in the red, there were other means of preventing revolution. Often wars of acquisition (Conquest Model) were waged merely to gain the spoils or, in today’s modern language, increased money supply. This normally brought inflation along with prosperity and kept the domestic population happy for a while (economic stimulation). 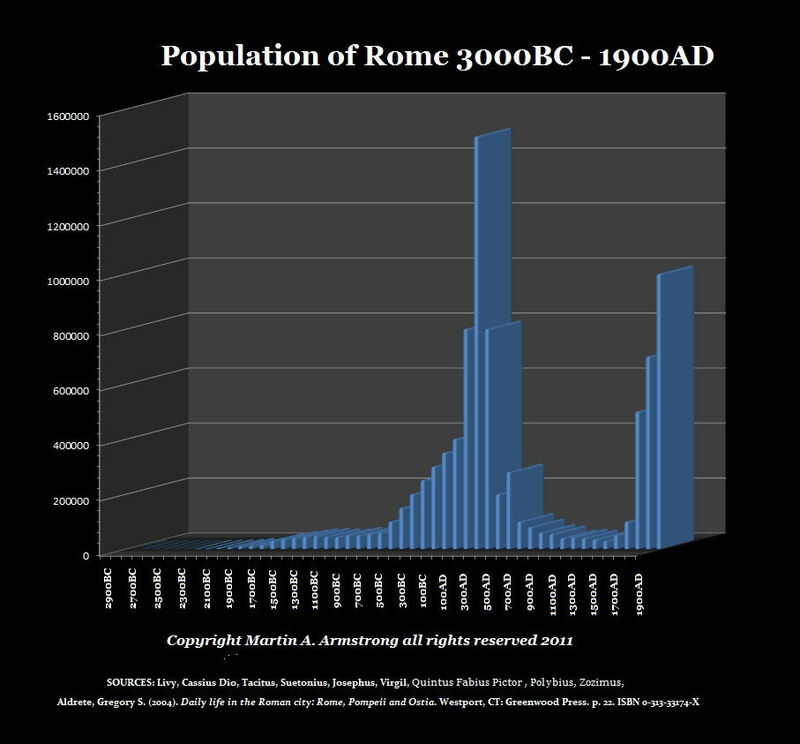 Rome made so much from the Punic Wars that they abolished taxation in the city of Rome. Using precious metals for money did not eliminate all evil. The private sector had its own means of economic stimulation called counterfeiting. 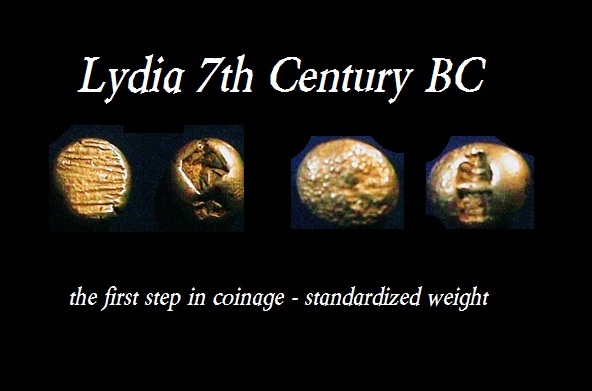 Here is a coin from Lydia 7th century BC with 9 moneychanger marks (foreign exchange brokers) verifying they tested the metal. 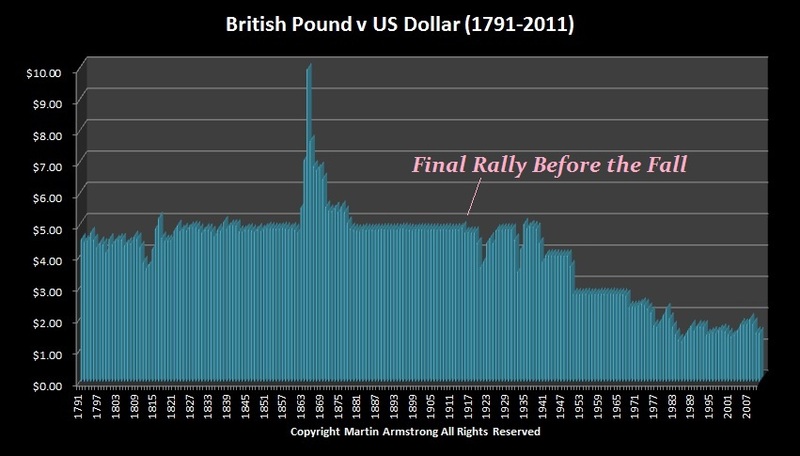 This demonstrated that CONFIDENCE was not present simply because government weighed and valued its coinage by decree. If people trusted government, why test each coin? The whole reason people began to use banks was because the “money” could not be verified. Just because the coins were silver or gold did not mean anything. They could be debased, shaved, or forged. You deposited money in a bank and the bank CERTIFIED you were paying in “good” money. People did not want coins, they wanted the bank paper receipts that became paper money. Like the moneychanger, the bank was certifying the transaction was taking place with proper value in “money”. Thus, paper money began in middle ages as receipts certifying deposits. 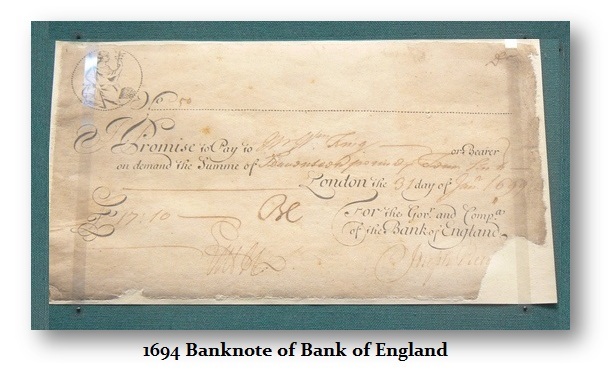 Even the first Bank of England notes were not a fixed denomination but were receipts for deposits. This note in 1694 states a promise to pay with the denomination written in. Notes eventually became standardized denominations enabling them to circulate freely. This was the same model as in ancient Egypt that always had paper receipts for grain in public warehouses trading as paper money. 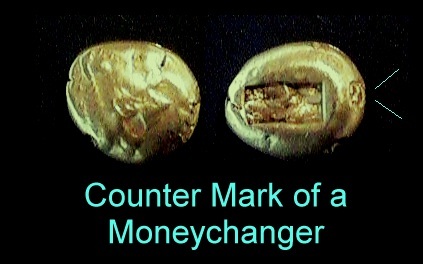 They did not have any coinage until Alexander the Great conquered them in 334BC. 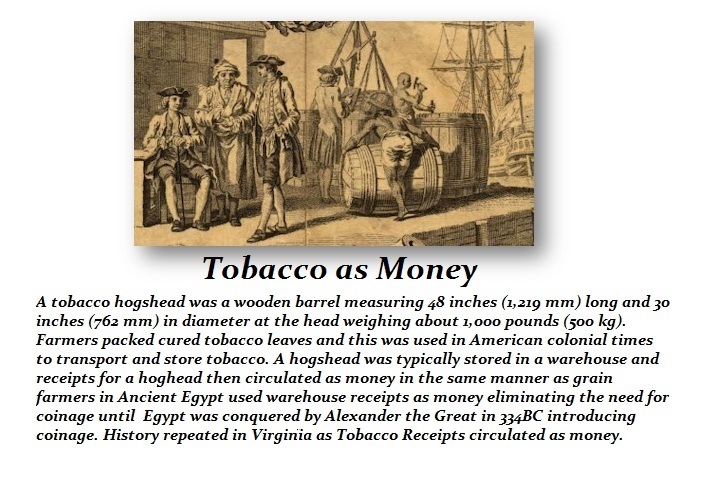 Virginia also had the same system of tobacco receipts that circulated as money in colonial times. The actual birth of paper money therefore relates to the desire of placing bulk grain, tobacco, or even coins into a bank and using receipts for the transfer of payment. This system emerged in ancient Greece at the island of Delos and this was copied by the Romans. China and Japan were the same from a monetary perspective. They never had circulating gold or silver coinage. This Western idea that money has to be tangible was never an Eastern concept. Money has always been based solely upon what someone else is will to accept. Go to a Starbucks and try to buy a coffee with a gold coin. They will not accept it. Some places will not even take a $100 bill anymore and want plastic. If they do not BELIEVE gold is acceptable for payment or you hand them $1 in 1964 silver quarters to by a $5 coffee, you are out of luck. They will see it as $1 not worth $5. This is the real economy.MONEY is only valuable based upon what the OTHER person believes – not you! Until the 17th Century, paper currency tended to be private issues by banks in the West and were not actually official government issues. One of the first official government issues of paper money in western society was made by cutting up playing cards during 1685 in Canada. The military payroll of gold was delayed on its journey from France and necessity dictated that some form of money had to be invented immediately. The spark of invention had dawned in the mind of a French paymaster. He took a deck of normal playing cards and cut them into quarter sections. He then, by hand, wrote various denominations on the sections of cards. They became “legal tender” when the official signature of the commanding officer, Jacques Demuelles, had been applied. The invention of paper money saved the day and these scraps of playing cards were declared to be legal tender for three months. When the ship came in, literally speaking, the paper money was redeemed for gold and everyone lived happily ever after. Or so we would think. This French Canadian invention sparked by necessity had given birth to the seeds of corruption. What man could resist such awesome power? Eventually the idea was used again in 1686, 1690, 1691 and 1692. Year after year the playing cards were being issued in substitution for real money. 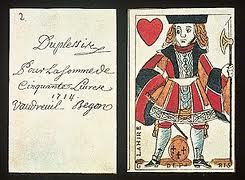 Finally, by 1701, the military government had issued more playing cards than there ever would be gold on its way from France to redeem these new monetary inventions. As a result, a lot of people ended up with chopped up, scribbled on scraps of paper that they couldn’t spend and were no longer usable even for a decent game of cards. It is ironic to note that playing cards were used to introduce the ultimate game of chance, the Paper Chase. We cannot credit the entire invention of paper money to a military outpost in Canada. The idea seems to have also developed along with the invention of the modern-day bank. During the mid-seventeenth century, goldsmiths were renowned for their secure vaults. If anyone had a store of valuables, it was your common every day goldsmith. Eventually, goldsmiths realized it could be very profitable to store someone’s gold for a fee. A receipt was given for the amount of gold which was to be stored. It was not long before these receipts were being used as collateral and often payment in gold was passing around in the form of receipts, without the physical gold ever leaving the goldsmith’s vault. Sooner than expected, the birth of a new banking system had taken place. The receipts became written orders to transfer gold from one account to another; or in modern terms, a bank check. A brilliant idea came to the goldsmith. He realized that a portion of the gold could be lent out for even greater profit (interest) and never be missed. After all, odds were surely against everyone withdrawing their entire deposits of gold at the same time. Greed and corruption finally created another version of the Paper Chase and in the process, gave rise to the banking system. By now, the goldsmith was issuing more receipts for gold on loan than there actually existed in his vault. Like so many financiers to follow, the goldsmith didn’t know when to quit. He had more than tripled the amount of receipts that now passed as freely among the local population as dollar bills do today. The net result was inflation, prosperity and good times. But the day of reckoning arrived when the townspeople found out that all they really owned was a piece of paper and the gold it represented didn’t actually exist at all. The entire town had been played for a bunch of fools. The receipts had created enormous inflation, since on paper, there was more gold floating around than the goldsmith held in his vault. It had appeared as if there was more gold than goods. It was only natural that the goods, being scarcer than gold receipts, rose in value as they were sold to the person with the most receipts or, in plain terminology, cash. It was a major breakthrough – the rediscovery of INFLATION coming out of the dark ages. It was as real to them as we have ever experienced in our lifetime. When the townspeople found out what the goldsmith had done, the paper gold receipts became totally worthless. The goldsmith didn’t have enough real gold to back up the substituted paper receipts, which everyone had considered to be money. Inflation, which had brought on temporary prosperity, led to depression and riots. The outcome was very predictable. One dead goldsmith usually followed. The Paper Chase has been a dream of man for nearly 300 years that is emerging as old school. It is that quest, that desire to get rich quick or to create something intangible that people would accept as money. There has been one inherent problem with paper money. No matter who has been in charge of its issue, the same problem has constantly occurred. The controlling party who is has never been able to resist the temptation to print just a little more than he should. During the late 1600’s, America was to become the official test pilot for paper money economics. The entire world was to watch a bold attempt to create something from nothing. 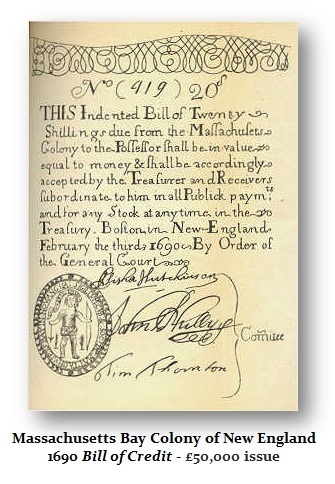 The first mass-produced printed paper money for general circulation was invented when Massachusetts lacked the tangible money (gold/silver/copper) to pay its troops fighting the French during 1690. 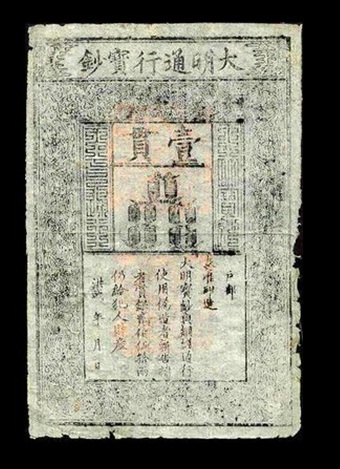 They issued paper money which they officially called “Bills of Credit.” The government tried to encourage the people to accept the new funny money by guaranteeing a 5% premium to those who used the bills of credit (paper money) to pay their taxes. South Carolina loved the idea and issued its version of the Paper Chase game, also called “Bills of Credit,” to finance the Spanish and Indian war of 1703. The Queen Anne’s War of 1702-1713 brought forth paper money issues in 1709 from New Hampshire, Connecticut, New Jersey and New York, promptly followed by Rhode Island in 1710. North Carolina needed money and decided to create it via this new paper experiment. They printed large quantities to pay for the war against the Indians in 1712. This new game of the Paper Chase was, in effect, an I.O.U. – borrowing for a public expenditure. No one could have possibly imagined where this bold venture would lead. Sure enough, the latest political game, the Paper Chase, took hold. Each Colony found reasons to commence and continue its own issuance of paper money. 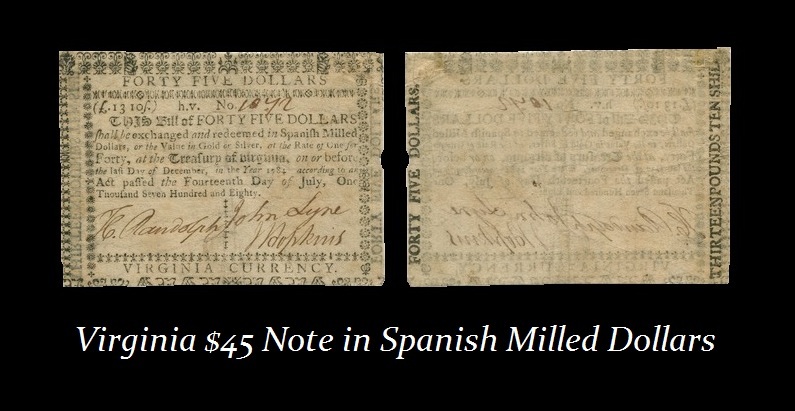 Many of the early issues promised to pay in Spanish milled dollars. Clearly, if one Colony didn’t print the currency, a neighboring Colony would print the worthless stuff to circulate within their own territory. Then the first would not benefit from the issue of paper money. This set off a competitive race among the colonies all participating in the Paper Chase. 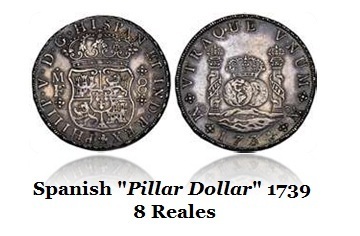 By the early 1700’s, the Colonies had abused the issue of paper money to such an extend that what few silver Spanish Dollars (8 Reales) which managed to circulate, began to command a handsome premium. Spanish Dollars and their fractional derivatives (“pieces of eight”), were able to purchase three times the amount of goods as a colonial paper dollar. Simply put; inflation had taken its toll. Paper money had created a new age of deficit spending for such things as the repair or construction of jails, harbors, court houses, lighthouses, buoys, forts and just about anything else that they didn’t have the real money to pay for in those days. In fact, Maryland’s first paper money issue was used to reimburse farmers taxed in 1733 for being forced to burn off a portion of their tobacco crops to support the price of huge inventories on hand. Maryland issued propaganda notes to fund the production of gunpowder in 1775 for the Revolution. 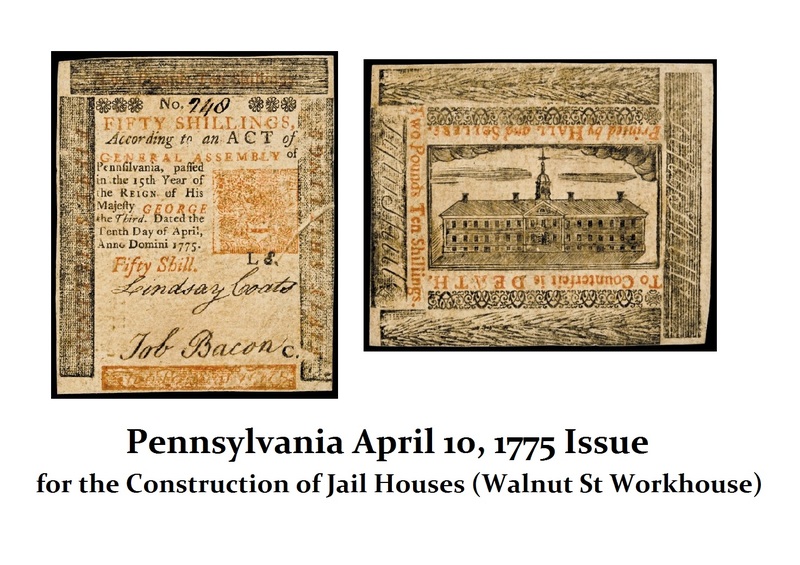 In 1769, Pennsylvania printed paper money to institute the first welfare program for the poor in Philadelphia. Despite signs of inflation and the increased volatility in local commodity prices, this experiment was far from complete. The next great idea brought about government “Loan Banks.” Colonial Assemblies established loan offices and printed paper money to loan to people who could put up their land as security. The Colony charged interest and, in some instances, the interest was payable only in gold or silver! Notes were also issued to pay for the construction of jails and lighthouses. 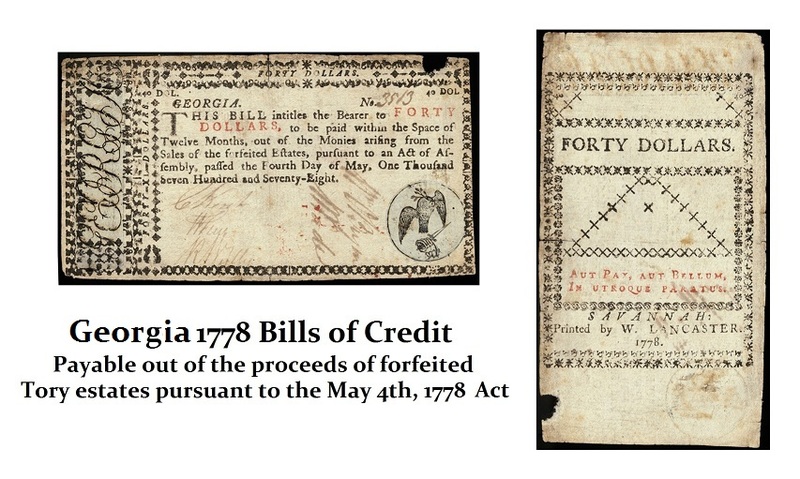 Georgia issued Bills or Credit in 1778 backed by the confiscation of assets from Tories who supported the king. Clearly, there was not necessarily the freedom to oppose the Revolution in all places. Naturally the idea spread to Europe. But the idea was never carefully studied. The whole system had become seriously out of control. Consequently, by the time the Continental Congress was formed, it too issued paper money called Continental Currency to finance the American Revolution. In total, $241,552,780 were printed and anyone who did not accept this new paper money was declared a traitor, an enemy, or a tory. There was so much worthless paper money circulating about, it became necessary to take some drastic measures. But there was so much of it circulating around, inflation ran completely out of control to the point that it actually cost the government more to print the paper money than what the money would buy. This sparked terms such as “not worth the paper it’s printed on” and “not worth a Continental” – catch phrases that are still present in American slang more than 200 years later. The truth is, everyone was trying to get rid of them in exchange for anything of real value he might be able to buy – land, commodities and even businesses. To top the entire matter off, the British were counterfeiting the Continental paper money, a warfare tactic later used during World Wars I and II. The expense of the Revolution was great. Paper money was worthless and the war was won by nothing more than guts and spirit in the end. By 1781, the Continental Congress incorporated the Bank of North America. The paper money and copper coins remained a difficult task to circulate. Gold was rare and silver circulated only to a limited extent. 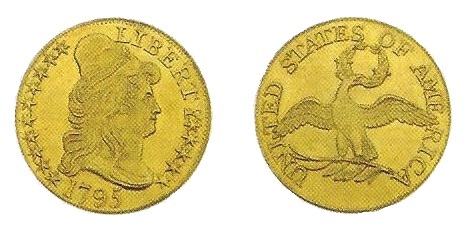 The Continental Dollars were devalued and exchanged at the rate of $1,000 to $1 in gold. With gold fixed at $19.393 in “new” dollars, the peak was official. Gold had peaked in 1781 at $19,395.00 (CONTINENTAL DOLLARS) per troy ounce. Naturally a severe lack of confidence had set in. If there had not been the emotional satisfaction of winning the war, we may have called it quits right then and there. The discovery of inflation, hyperinflation, collapse and depression had become the first economic experience of the United States. During 1793, the U.S. attempted to create its own new money supply. Copper was used to mint 1,819,067 coins, while silver was used to mint 409,560 coins. Gold was as rare and valuable in those early days as it is today. There was only enough gold to mint a mere 15,253 coins. 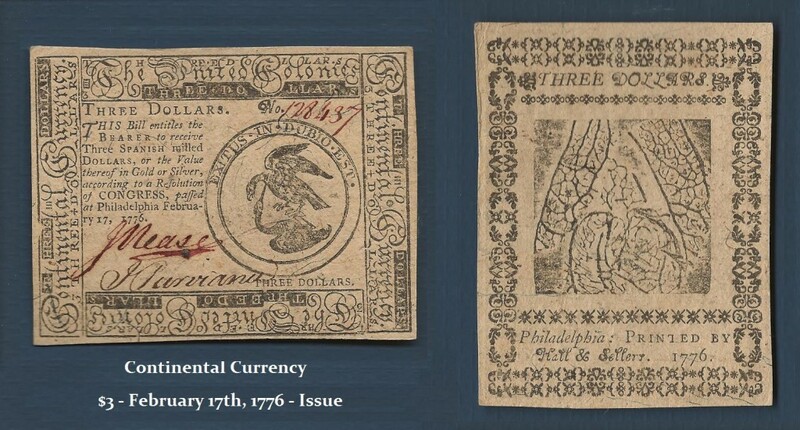 To this day the collapse of the paper money of the Continental Congress and the independent States has left its mark upon the monetary system within the United States. The Constitution of the United States took away all rights of the states to issue paper money and strictly reserved that right for the Federal Government. However, even today most people look upon the treasury bonds of the United States as being one of the most secure of investment instruments. They are under the misconception that the U.S. Government has never once defaulted upon its debt obligations. However, this is yet another misconception. The Articles of Confederation which were adopted on June 26, 1778 clearly provided that all the paper money issues that had been previously issued by the Continental Congress were to be charges against the United States. In 1787 the Constitution also stated that the debt obligations of the Continental Congress were to be assumed by the new United States government. In both cases, the total debt of outstanding Continental Currency, which was $241,552,780, were to be made good by the U.S. government. Alexander Hamilton proposed and offered to the people an exchange of currency of $1 to $100 for U.S. Treasury Bonds. However, the people were led to believe that the currency would become redeemable in the future without any mention of devaluation. In light of these representations to the people who the debts of the Continental Congress would be settled, the U.S. government to this day stands in default of that obligation. Of course the people were precluded by law from bringing suit against the government. However, since the 1900’s that right now exists. It would be an interesting court case indeed if someone were now to demand that the U.S. government redeems the outstanding $241 million at full face value with accumulated interest since 1782. As time went on, confidence was slowly restored and the government withdrew from issuing paper money on a large-scale that was not strictly and fully backed by gold. By 1815 a new round of deficits had accumulated which was caused primarily by the War of 1812. The government issued Treasury Notes which served as currency in the form of promissory notes that actually paid interest. People were reluctant to accept the money particularly after past experiences. Therefore a new twist had been invented. Interest was actually paid to the bearer of this new paper money on denominations over 50 dollars. The smaller notes were once again merely circulating pieces of paper. The War of 1812 was followed by the “Hard Times of 1827-1843”. 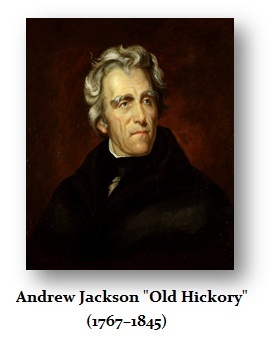 Andrew Jackson’s Bank War was devastating. He destroyed the Bank of the United States and shifted government deposits to state banks and this unduly gave a false sense of security to the public to trust banks that became known as Wildcat Banks. The public had been played for fools once again thanks to Jackson. The country had been blanketed by private bank notes which became worthless as bank failures emerged as a common day event. Thanks to Jackson, people relied upon these state banks and many opened up with no backing just to issue paper money that they would then sell in New York at deep discounts. Thousands lost everything they had during this collapse of the paper money system. 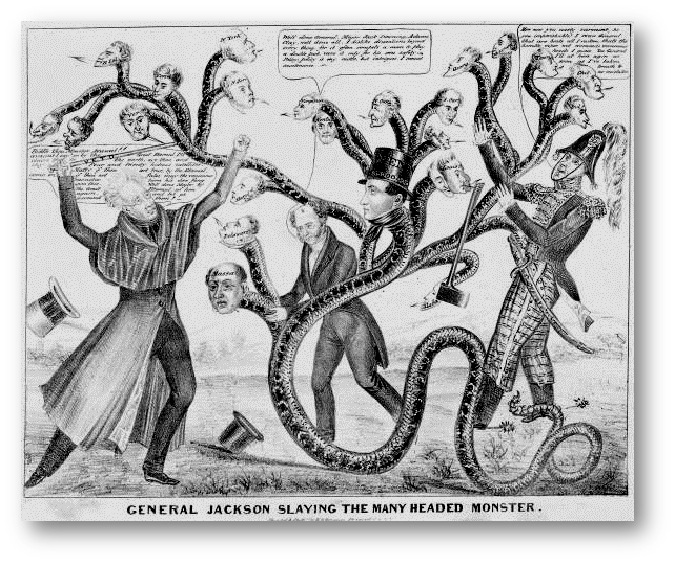 This was just one part of the crisis that Jackson set in motion. Next came the massive default of state bonds. Jackson ushered in the Broken Bank Note Era/Wildcat Banking with massive bank defaults. The lack of a central bank was far worse. All of these banks nobody could find many banks that issued money and it all circulated nationally. The consumer was clueless as to which banks were real and other outright frauds. Those that just look at Jackson taking down a central bank and cheering, they fail to look deeply at the Broken Bank Note Era, which. led to the Panic of 1837 that then set in motion the Sovereign State Debt Defaults of 1839-1843. In 1841 and 1842, eight states and the Territory of Florida all defaulted on their sovereign debts. Traditional histories of the default crisis have stressed the causal role of the depression that began with thePanic of 1837, unexpected revenue shortfalls from canal and bank investments as a result of the depression, and an unwillingness of states to raise tax rates. However, these stylized facts do not fit the experience of states at all very well. The majority of state debts in default in 1842 were contracted after the Panic of 1837; and most states did not expect canal investments to return substantial revenues by 1841 and did not experience unexpected shortfalls in those revenues. Finally, most states were willing to raise tax rates substantially and did. The relationship between land sales and land values explains much of the timing of state borrowing and the default experience of western and southern states. Pennsylvania and Maryland defaulted because they postponed the imposition of a state property until it was too late. The United States was the emerging market for Europe and these defaults ruined its credit for decades to come. The Bank of England still has some State debts that were never made good. The Panic of 1837, which had been caused by an overexpansion of banks, caused farmers, planters and merchants to lose their enterprises. This led to an economic contraction that further reduced bank deposits causing bank failures as the depression then settled into the states from which it sprang. States issued bonds to try to bail out the banks and many states ended in default. During the period, U.S. states borrowed more than $200 million by selling long-term bonds in domestic and international financial markets to finance transportation and banking projects. They went nuts borrowing and spending money and Andrew Jackson’s bank war merely gave them credibility they did not deserve. The total borrowing by the states approached a level nearly twice as high as the debt of the federal government at its peak during the period 1790-1840. The federal debt was largely the costs for the American Revolution and the War of 1812. These two wars were less than half what the states had borrowed during their spending binge and fiscal mismanagement. In 1841, state debts outstanding totaled $198 million. Then the improvement era came to a screeching halt. In 1841 and 1842, eight states and the territory of Florida defaulted on their debts. Three other states narrowly avoided default. 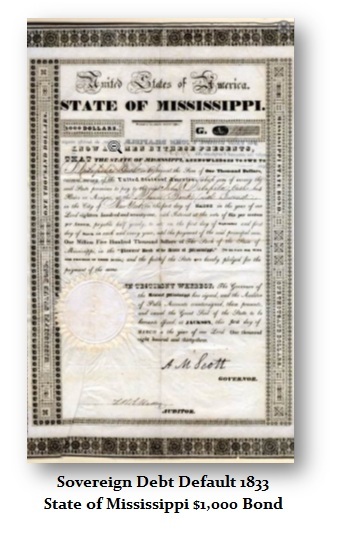 Five of the nine defaulting states repudiated all or part of their debts entirely – Arkansas, Florida, Louisiana, Michigan, and Mississippi. The credit of the U.S. federal government, which never defaulted after the debt restructuring of 1790, was tarnished for decades along with the states that did not default. 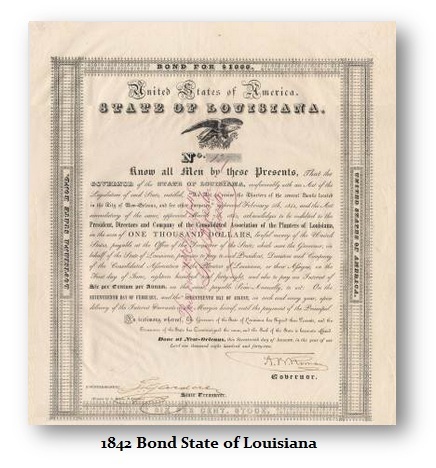 Pictured here is a State of Louisiana bond issued in 1842 and is hand signed by the State’s Governor, Andre Bienvenu Roman and its Treasurer, F. Gardner. 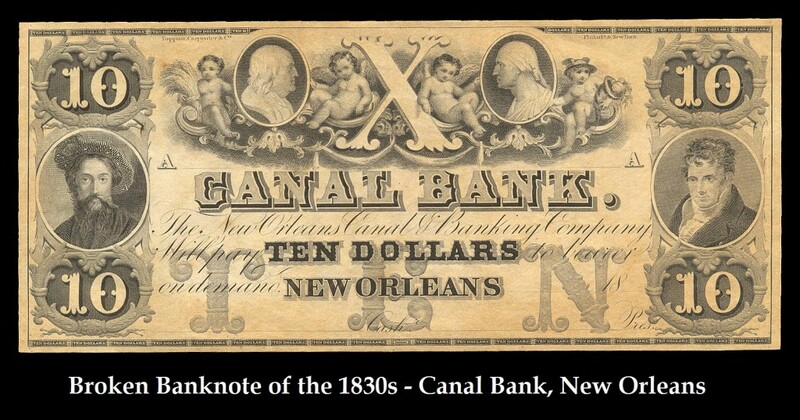 This historical document states it was issued to “…revive the Charters of the several banks located in the City of New Orleans…” Louisiana experienced years of economic growth as the number of banks doubled and capital increased thanks to Jackson’s bank war. 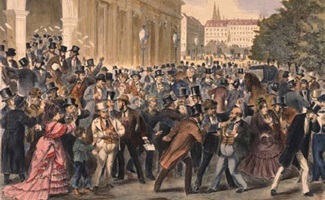 The state banking crisis that was instigated by the Panic of 1837 was relieved only by new banking laws. In the aftermath, instead of asking why some states borrowed so much, politicians at the time focused on the debt crisis itself and asked how states could have gotten into such an embarrassing mess. This era led to the US-Mexican War of 1846 to 1848 came in the wake of the 1845 U.S. annexation of Texas, which Mexico considered part of its territory despite the 1836 Texas Revolution.War also comes on the heals of economic decline often to distract the people from the evils of government itself. This was then followed by the Panic of 1857, which was truly an international panic. Soon after the Panic of 1857, the government found itself in desperate need of money to finance the Civil War. An Act of Congress on July 17, 1861, permitted the Treasury Department to print new paper currency to the extent of sixty million dollars. Copper, silver and gold were in short supply and this new issue of currency could not be lawfully converted into coin. The Government forced the public to accept this new paper money purely on faith. This, in turn, sparked the term “Greenback,” since the dollar was backed by nothing more than the green ink used to print the reverse side of the note. By March of 1862, five new issues of paper money had been authorized, this time the notes were called “Legal Tender” and were valid for “all debts public and private except duties on imports and interest on public debt.” The government expected the people to accept the notes. However, when it came to taxes only gold or silver would be accepted by the government. The term “Legal Tender” meant that this issue would be accepted for payment of taxes. Deficit spending created by the Civil War had brought the financial position of the Treasury Department into crisis as the dollar traded against gold on the NY Stock Exchange and the value of the dollar collapsed against the British pound going int 1874.Foreign countries selling goods to the U.S. demanded payment in gold or silver. Tangible money (coin) had become very rare despite the new taxes imposed during 1862 on everything from bank checks, playing cards and telegraphs to mortgages, bonds, insurance, photographs, certain transactions leases and wills. The bureaucracy grew just trying to collect all the taxes on so many varied transactions and items. Copper, silver and especially gold coins had disappeared from circulation and postage stamps were actually used to make small change. 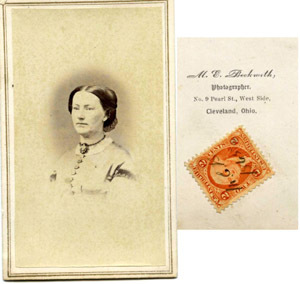 Postage stamps were placed in small enclosed containers and circulated as money. This brought a new dimension to the paper money con-game. 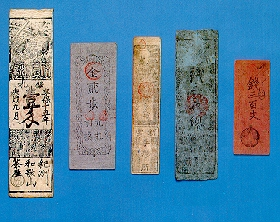 A series of fractional paper money was introduced in denominations of 5 to 50 cents. 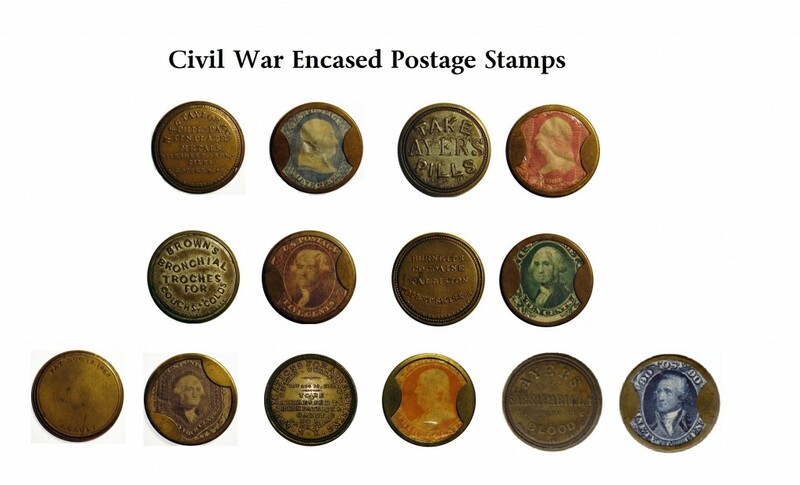 To insure public acceptance, it was called “Postage Currency” and was backed by actual postage stamps. The postage stamps which had circulated already, proved to be impractical. Hence, paper money backed by postage stamps was invented. After all, if you couldn’t spend it as currency, you could at least buy a postage stamp to write home and ask for some real money when things got bad. By 1864, the government would do anything to continue printing paper money. They didn’t even have enough gold or silver to pay the people who had printed the paper currency. Finally, in a desperate attempt to restore some confidence, an Act of Congress of June 30, 1864 authorized another series of paper money. This time with another brilliant idea far better than postage stamps. The Government created “legal tender” currency that actually paid 6% interest compounded twice a year for three years only. On the back of each note was a payment schedule showing that, if accepted, the note would pay $11.94 for every $10 face value upon redemption after three years. Today, very few of these notes remain in public hands. Taking into account the perilous state of the nation during those years, coupled with the rarity of real money, runaway inflation and general fears, it would have been a very rare person who didn’t scramble to cash in his interest bearing currency upon the day of expiration. 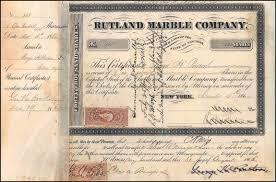 This form of interest bearing currency was, in reality, circulating war bonds. It did restore some confidence since the compounded interest gave some added assurance that inflation would not render it worthless as long as government honored its debts. As a result, three subsequent interest bearing issues were released. However, inflation had persisted. To still ensure acceptance in the face of rising inflation, the interest rate was subsequently raised to 7.3 percent later that year. After the Civil War, inflation continued and the view was that the government would return to the gold standard. This entered the next scam where James Fisk (1835-1872) and Jay Gould (1836-1892) sought the support of federal officials of the Grant Administration in order to push the price of gold up before the US government returned to the gold standard after the Civil War. 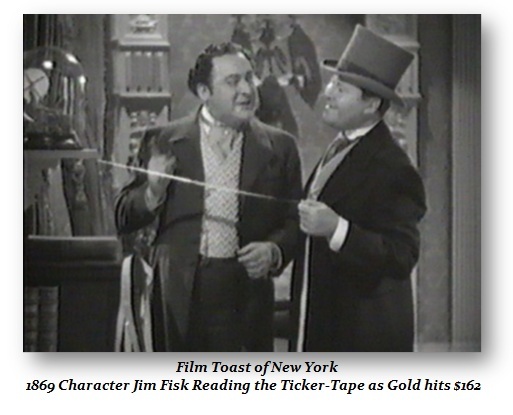 The intent of the scheme was to force the government to accept whatever free market price gold would reach on the open market as traded on the New York Stock Exchange at the time. The “gold-ring,” as came to be known, planned to corner the market forcing the price of gold higher and in the end, their intended exit strategy would be the government itself. The gold-ring’s leader was Jay Gould. From the humble beginnings of a country-store clerk, Gould rose to control half of the railroad mileage in the Southwest, New York City’s elevated lines, and the Western Union Telegraph Co. Aided by James Fisk, he defeated Cornelius Vanderbilt for control of the Erie RR. However, this visible episode led to huge public protest over Gould’s stock manipulations and resulted in his expulsion in 1872. Gould then bought in the Union Pacific and other Western roads, and by keen business practices gained control over four rail lines that eventually made up the Gould system. The run on gold was halted toward the close of the business day only when US Secretary of the Treasury George Sewall Boutwell announced that the federal government had made $4 million of its gold reserves available for trading. This was an excessive amount, which they did not actually have at the time. Nevertheless, the announcement broke the back of the gold ring and prices collapsed. Only later did the Treasury admit that they had made a “mistake” in the amount of gold that would be release in their press statement. Instead of $4 million, the amount was actually only $400,000. Real or not, the statement of by the US Treasury caused gold to collapse abruptly bringing the price from $162 to $133 within 15 minutes. The Gold Panic of 1869 was by far the strongest rally of all time even surpassing the rally of 1980. Gold would eventually peak in September of 1869 only after making a substantial ten-fold rally as reported by the NY Times on September 24th, 1869. The political corruption at the time was wide-spread and the President’s brother-in-law was rumored to be part of the gold-ring. It was reported that half of all businesses and banks in New York City folded as a result of this financial panic of 1869. The lack of confidence at the time was sparked by not only the corruption within the Grant Administration, but also due to the existence of the “greenback” itself. Although the greenback was legal tender, it was not introduced until 1861. 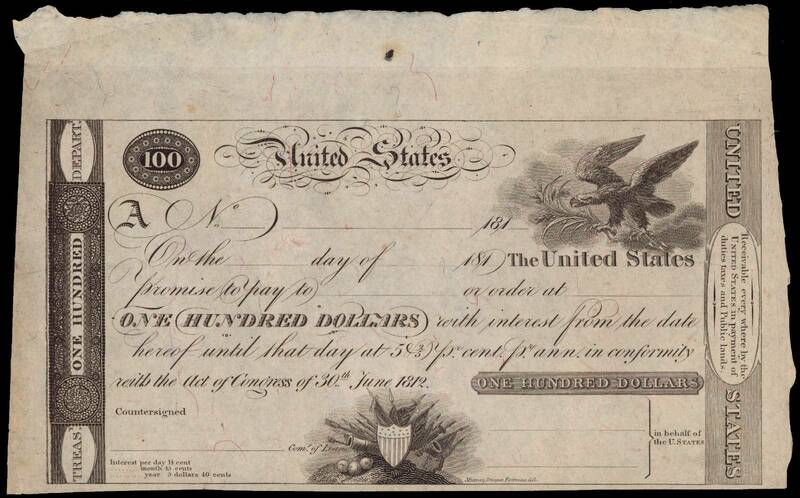 Between 1792 and 1861, the US government did NOT issue paper currency. Therefore, the introduction of the Greenback was caused by the need to fund the Civil War and represented the first issue of a federal paper currency since the collapse of the Continental Currency of the late 18th century. Consequently, the unbacked status of the US paper currency of the time brought back horrid memories of the Continental Currency Crisis. While the US greenbacks were first issued in 1861 by the US federal government in an effort to fund the Civil War, by 1865, more than $450 million worth of these issues were in circulation. Originally issued as “temporary”, the notes were to be recalled following the war. However, the hard times of 1867 led to demands, particularly by Western farmers, for an inflated currency through the creation of more greenbacks. 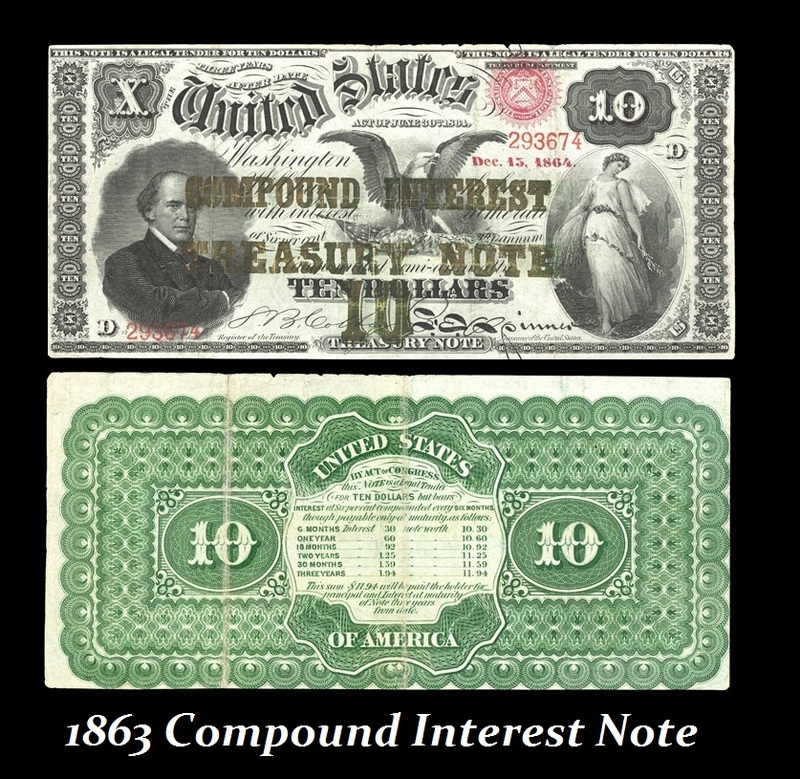 A compromise was finally reached in 1869, whereby greenbacks to the amount of $356 million were left in circulation; the law authorizing them was declared constitutional in the Legal Tender Cases of 1868, 1870, and 1871. This issue of a paper currency reappeared during the Panic of 1873, with hard-hit agrarian, intensely opposed by conservatives, once again demanding creation of more greenbacks. The conservatives triumphed and the Resumption Act of 1875 fixed January 1st, 1879 as the date for redeeming all greenbacks. With returning prosperity, however, confidence in the government began to soar, and few greenbacks were surrendered. In 1879 Congress provided that greenbacks currently outstanding ($346,681,000) would remain as a permanent part of the nation’s currency.